Russia is struggling to contact a military research satellite believed stranded in a low orbit by a rocket failure, according to Russian media reports. The spacecraft lifted off on a Rockot launch vehicle at 1400 GMT (9 a.m. EST) Tuesday from the Plesetsk Cosmodrome about 500 miles north of Moscow. The two-stage Rockot, a converted ballistic missile, flew north from Plesetsk toward space. 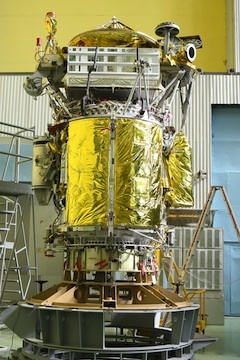 A Breeze KM upper stage was supposed to fire twice to propel Russia's GEO-IK 2 satellite to an orbital altitude of 1,000 kilometers, or more than 600 miles, about 90 minutes after blastoff. But U.S. military tracking data indicate the rocket is still in an elliptical transfer orbit with a peak altitude of about 650 miles and a low point of 200 miles. Such an orbit might indicate the hydrazine-fueled Breeze KM engine did not ignite for a second time as planned. Russia's Novosti news agency quoted Oleg Ostapenko, commander of Russian space troops, as saying the satellite was placed in a bad orbit. Russian controllers are attempting to establish control of the craft, which did not radio back to Earth following launch. Officials are setting up a commission to investigate the cause of the anomaly, according to Khrunichev, prime contractor for the Rockot launcher. The GEO-IK 2 payload is the first of two new satellites planned for geodetic measurements of Earth's shape, rotation and gravitational field. GEO-IK 2 is also designed to probe plate tectonics, tides and movements of the poles. Such research has military and civilian applications. The GEO-IK 2 spacecraft includes an altimeter built by Thales Alenia Space of France. The satellite's builder was ISS Reshetnev.